As seniors age, it is important they continue to exercise on a regular basis. Exercising is a great way to prevent a variety of illnesses, including osteoporosis, heart disease, diabetes, and more. Seniors can face a variety of challenges as they age, many of which can be mitigated with the help of professional in-home caregivers who provide high-quality at-home care. Rhode Island families trust in Home Care Assistance to help their elderly loved ones age in place safely and comfortably. Yoga is a great form of exercise that can keep the mind clear and the body in good shape. Here are a few ways yoga can boost your elderly loved one’s health. High blood pressure is especially harmful to seniors because it increases their risk of heart and kidney disease. Doing yoga relaxes the mind, which lowers blood pressure and keeps hypertension at bay. As your loved one ages, his or her memory and critical thinking skills may begin to decrease. Practicing yoga can protect your loved one’s memory and thinking skills and slow the progression of age-related diseases like dementia and Alzheimer’s. The synchronized movement practiced in yoga is one of the ways it helps preserve the memory. As your senior loved one ages, certain exercises may make him or her slightly winded or out of breath. Aging causes the respiratory system to slow down, and the lack of oxygen could have a negative effect on your loved one’s entire body. The breathing techniques your loved one does when performing yoga can boost his or her respiratory health. Yoga is a good form of exercise for seniors who are living with depression, anxiety, and stress. The three basic parts of yoga are breathing, movement, and meditation, all of which can enhance your loved one’s emotional health and overall wellbeing. Yoga increases GABA levels, a brain chemical that can calm the nerves. As a result, your loved one’s mood may receive an immediate boost, and his or her anxiety levels may decrease. As your loved one ages, his or her joints may become stiffer. 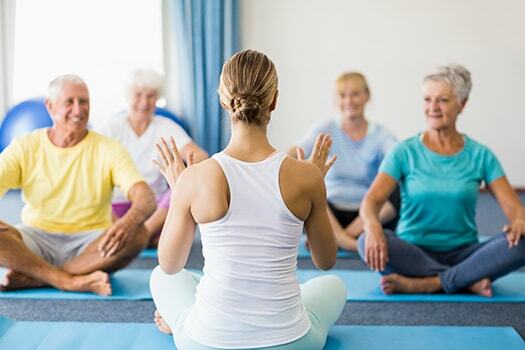 Practicing yoga on a regular basis can lubricate the joints and slow the progression of arthritis, carpal tunnel syndrome, and other debilitating disorders, allowing your loved one to complete a variety of daily tasks independently. Preserving the ability to bathe, get dressed, fix meals, and complete other daily tasks can help your loved one maintain independence for longer. If your senior loved one needs hourly or live-in care, Rhode Island Home Care Assistance can help. Our caregivers can assist with exercise and mobility, prepare nutritious meals, provide timely medication reminders, and help with a wide array of other important daily tasks. Diabetes is fairly common among aging adults due to poor dietary choices, inactivity, high glucose levels, depression, and various other reasons. Practicing yoga is a great way for seniors to manage type 2 diabetes because it can impact insulin production and increase glucose levels. Encourage your loved one to try yoga so he or she can stay active for longer. If your aging loved one needs occasional help with bathing, grooming, cooking, or other basic household tasks, or if you need time to attend to important personal matters, reach out to Home Care Assistance, a leading provider of live-in and respite care. Rhode Island seniors can maintain their independence while living at home with the help of our reliable respite caregivers. Call one of our qualified Care Managers at (401) 284-0979 to learn more about our senior care services and how they can benefit your loved one.